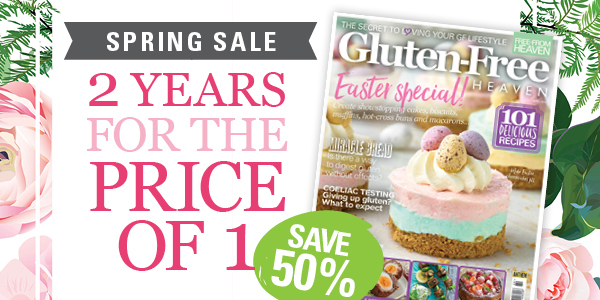 The Gluten-Free Heaven Spring Sale starts now! A Gluten-Free Heaven magazine subscription brings you 101 carefully selected, seasonal, gluten-free recipes every issue. Whether you choose to eat gluten-free as part of a healthy diet, are gluten-intolerant or have coeliac disease, the great range of tempting and nutritious recipes in this beautiful magazine will help you enjoy varied and tasty meals every day of the week. And with a new issue every month, you’ll never run short of new ideas, features and inspiration. Eating gluten-free can be a challenge – let Gluten-Free Heaven make your life just that little bit easier – and a whole lot tastier! Subscribe today for your monthly fix of gluten-free recipes and advice! 2 for 1 offer is only available to UK, USA, Australia and Europe in local currency. Offer is based on the cover price multiplied by 2 years’ worth of issues divided by 2, thereby saving 50% off the store price. Your subscription will start with the next available issue. You will receive 12 issues of Gluten-Free Heaven magazine per year. Want to know more about Gluten-Free Heaven magazine? Check our previous issues, click here to view back issues of Gluten-Free Heaven magazine. Get the Gluten-Free Heaven app! We also have a fantastic app where you can download the latest issue of Gluten–Free Heaven or subscribe to the digital edition. Go to your App store and search for Gluten-Free Heaven or go to Pocketmags to order now!